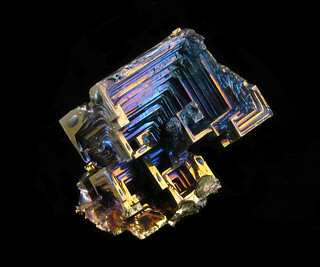 A close-up of a small bismuth crystals, 30 mm. The crystal gets its colours from a thin layer of bismuth oxide. I have used my improved photo studio, which allows for a full black background. No photo editing was done except for the removal of some reflections on the glass plate underneath the crystal.